Options abound for experiencing Las Vegas on a budget, with most hotels and casinos offering free-admission gardens, performances, and interactive visitor experiences throughout the day and night. Visitors can also get an up-close look at several of Vegas' top live shows as part of free behind-the-scenes tours, available without advance reservations. Cirque du Soleil KÀ Complimentary Theater Experience takes participants behind the scenes at the hit Las Vegas show Cirque du Soleil: KÀ, which uses martial arts and acrobatic elements to unfold a tale of two twins on a quest to manifest their shared destiny. No reservations are required for the free tour, which is offered twice during the afternoon hours on Tuesdays and Saturdays and may be taken without ticket purchase for a performance. Participants can get an up-close glimpse of the show's astounding artistic and special effects elements, which utilize one-of-a-kind technologies to create a $165,000,000 USD extravaganza. Tours last approximately 20 minutes are open to participants ages five and older, though all tour participants under the age of 18 must be accompanied by an adult. 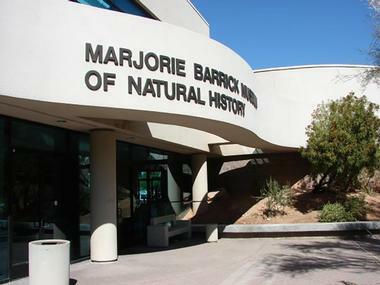 The Marjorie Barrick Museum of Art is a contemporary art museum located on the campus of the University of Nevada, housed within the campus' former gymnasium and basketball court facilities. Though the museum was originally opened as a natural history museum in 1967, it was incorporated into the university's College of Fine Arts in 2011 and today displays rotating exhibitions of engaging works by regional and national contemporary artists. A rotating collection of pre-Columbian pieces from the museum's collections are also showcased, along with an extensive research library that holds volumes related to contemporary and Meso-American artwork. Though the museum is free to enter, a suggested donation is recommended for adult visitors. The Hand of Faith Gold Nugget is the second-largest intact nugget of pure gold remaining in the world, showcased at Las Vegas' aptly-named Golden Nugget luxury hotel and casino, the largest resort in Las Vegas' downtown region. 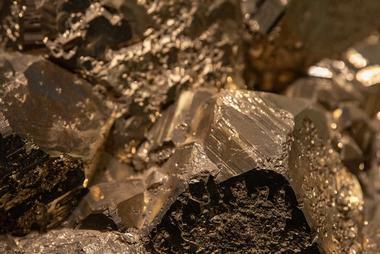 The nugget was originally discovered in 1980 in the Australian city of Wedderburn by amateur prospector Kevin Hillier and measures at a weight of 875 troy ounces, or approximately 61 pounds. It was then sold to the Golden Nugget for a sum of over one million USD, where it has been on display to the public for more than three decades. Today, visitors can view the nugget within a glass wall case near the hotel's lobby. 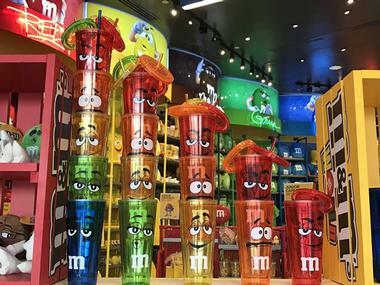 M&M's World is a 28,000-square-foot retails shop devoted to one of the world's favorite candy brands, located within Las Vegas' Showcase Mall. The four-level store is home to a wide variety of one-of-a-kind M&M's-themed attractions, including an M&M's Personalized Printer that allows shoppers to select from a number of stock Vegas-themed designs or create their own messages to custom-print on bags of M&M's candies in 16 colors. A NASCAR®-themed area showcases M&M's Racing merchandise and memorabilia featuring Las Vegas driver Kyle Busch, centered around a full-size preserved race car. Visitors can watch several daily showings of a free 3D film, "I Lost My 'M' In Vegas," which stars the brand's beloved Red and Yellow characters. Guests should note that while the store and film are free to experience, other attractions require a ticketed upcharge or purchase. Downtown Container Park is an eclectic shopping center in downtown Las Vegas that was constructed from 30 recycled shipping containers, emphasizing sustainability principles in its design. 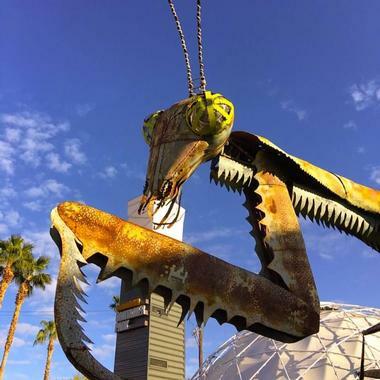 The open-air shopping center and pedestrian park is located near Vegas' Fremont Street district and showcases unique artwork and design elements, including a 55-foot praying mantis sculpture designed by artists Kristen Ulmer and Kirk Jellum for Nevada's Burning Man festival and a walkthrough bridge fashioned from a shipping container. An interactive children's playground features a 30-foot treehouse created from a shipping container and a NEOS Playworld System electronic race game, with a lawn for relaxation and concert stage for public special events. Inside the shopping center, visitors can peruse upscale and vintage boutiques and eat at restaurants such as Bin 702, Cheffini's Hot Dog, and the Downtown Terrace. The CityCenter Fine Art Collection is the first major permanent fine art collection in Las Vegas to be incorporated into a public space, located around the campus of the ARIA Resort and Casino, which includes the Vdara Hotel, Veer Towers, and the Shops at Crystals. The collection showcases personally commissioned works by 15 internationally-acclaimed artists working in the mediums of sculpture, painting, and installation art. Works on display include both purchased artwork selected for its high artistic merit and site-specific new installations, with pieces on display including Maya Lin's Silver River, Tim Bavington's Champagne Supernova, and Jenny Holzer's VEGAS. 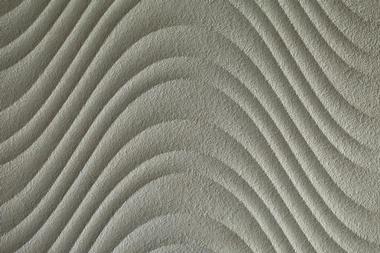 Artwork can be viewed for free throughout the grounds of the ARIA campus by both guests staying at the resort and pedestrians exploring the Vegas Strip. The Free Circus at Circus Circus is the largest permanent circus in the world, showcasing spectacular international acts and remarkable daredevil stunts. 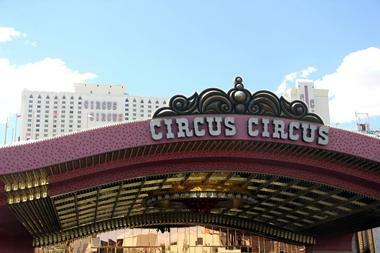 World-class circus acts are highlighted daily in free performances beginning at 11:30am, located at the Circus Circus Hotel and Casino on the Vegas Strip. 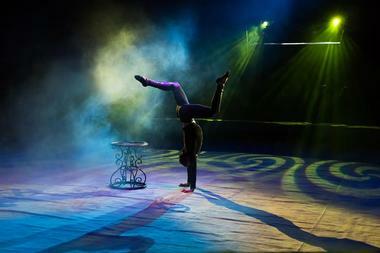 Acts on display include the Flying Poemas trapeze troupe, the Naira silk aerialists, the Cherifian Troupe of acrobats, and performers from the Imperial Acrobats of China. Visitors should note that seating is limited and fills up quickly prior to performances, with recommended arrival at least 15 minutes prior to performance time. Standing-room seating is also available for late arrivals. After the circus, visitors are welcome to explore the resort's carnival-style midway, which offers more than 200 chance and redemption games. The Fremont Street Experience is one of Vegas' most unique signature attractions, spanning five blocks along the western portion of Fremont Street, which originally served as the city's downtown district prior to the development of the Strip. Today, the district has been transformed into a major tourist entertainment center, anchored around a massive 1,500-foot LED display canopy that stretches over four blocks of the attraction, presenting continual neon-lit displays throughout the evening hours. 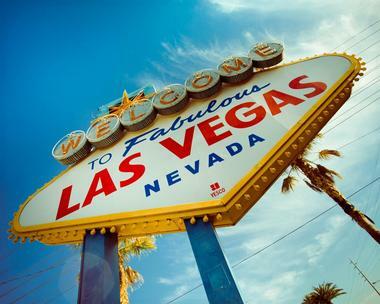 It is home to several iconic Vegas hotels and casinos, including the Golden Nugget, The D Las Vegas, and the California Hotel and Casino, along with a wide variety of shops, restaurants, and nightlife spots. Other public attractions include a SlotZilla zipline course and three concert stages, which present free nightly live music and entertainment. Harrah's Carnaval Court is one of the Vegas Strip's most exciting open-air street parties, hosted at the Harrah's Las Vegas Hotel and Casino. The party runs day and night and is free to enter without a cover charge, open to the public until 3:00am each night. Live music performances and DJ sets are showcased under the stars each night, with performances by Vegas lounge favorites, including the District, the Droids, Mr$Mrs Smith, and the Whip Its. Drink specials are available at select times, with drinks prepared by roving flair bartenders, and blackjack tables are available for guests to play for an additional gambling charge. On Saturday nights, a free concert series features performances by nationally-recognized pop acts such as Vertical Horizon. Visitors should note that although there is not a cover charge to enter the party on most nights, bouncers may deny entry based on evening crowds. Bellagio Conservatory is a spectacular 14,000-square-foot botanical garden facility located on the campus of the famed Bellagio Hotel and Casino resort. The free-admission conservatory is maintained by a staff of more than 120 horticulturalists and landscape designers and is decorated anew seasonally, celebrating iconic colors and blooms common to each season. Beautiful cherry blossoms are showcased during the spring months, while rich red, orange, and gold blooms are used to evoke the colors of autumn foliage. The conservatory is particularly noted for its winter holiday displays, including a Christmas-themed display and a special annual display for Chinese New Year. Visitors should note that the conservatory is dark for one week each season to accommodate changing seasonal displays. 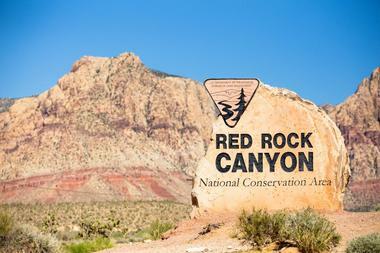 Red Rock Canyon National Conservation Area is a 197,000-acre conservation area located within Nevada's Mojave Desert, approximately 15 miles from Las Vegas' downtown district, though it is visible from the city's famed Strip. The conservation area attracts more than two million annual visitors, known for its immense 3,000-foot red sandstone peaks that comprise the Keystone Thrust, as well as notable areas of indigenous petroglyphs. Rock climbing opportunities abound, along with opportunities for hiking, biking, and horseback riding along the conservation area's many trails. Visitors can also explore the area by car or motorcycle along a 13-mile one-way loop road. Overnight camping is permitted in designated areas within the region. Ethel M Chocolate Cactus Garden is a free-admission botanical garden at Henderson, Nevada's Ethel M Chocolate Factory, spanning approximately three acres. The gardens were opened to the public in 1981 and showcase more than 350 unique varieties of cacti and succulents today, including significant collections of plants from the American Southwest, Australia, and South America. 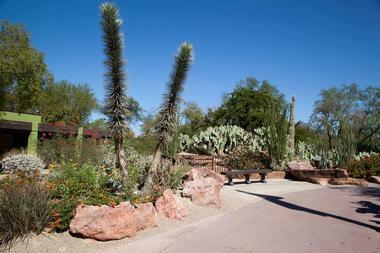 Species on display include ocotillo, prickly pear, giant saguaro, beavertail cacti, and desert willow. A Living Machine demonstration wastewater treatment apparatus is also showcased, recycling 100% of the factory's water waste through the use of algae, bacteria, fish, and snails. Public special events are hosted at the gardens throughout the year, including an annual holiday lighting ceremony and light show. Visitors can also explore the factory facility of the famed chocolatier as part of self-guided tours. The Aquarium at the Silverton is a 117,000-gallon tropical aquarium located at the Silverton Hotel, accessible to the public for free without hotel stay. The aquarium houses a population of more than 5,000 exotic marine life specimens, including fish, sharks, stingrays, and coral. Its tanks are also populated by scuba-certified mermaid performers in costume, showcasing dance, swimming, and acrobatic backgrounds to portray fantastical half-human, half-fish creatures. Diver feedings of stingrays are also presented periodically, with diver-audience question-and-answer communication made possible through the use of built-in speakers. 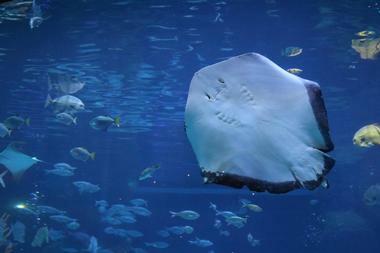 The aquarium is open to the public 24 hours a day, seven days a week. 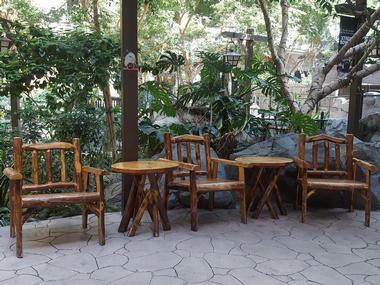 After checking out the aquarium, visitors can also view a mermaid art gallery directly outside the aquarium in the hotel's Mermaid Cafe and Lounge. The Fall of Atlantis is a spectacular free-admission animatronic display presented at the Forum Shops at Caesars, a high-end shopping center housed within the Caesars Palace resort and casino complex on the Vegas Strip. The show is set within the Kingdom of Atlantis, following the journey of nine-foot-tall animatronic puppet King Atlas as he chooses which of his sons will take the throne after him. Water and pyrotechnic fire elements are used throughout the show, which was developed by the special effects teams behind Thor and Pirates of the Caribbean. 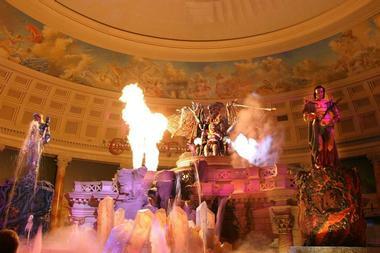 Other animatronic elements include a 20-foot winged dragon. The show plays each hour on the hour seven days a week, with extended performance hours during longer mall operation hours on Friday and Saturday evenings. After watching the show, visitors can peruse high-end retailers such as Chanel, Armani, Louis Vuitton, and Versace. The Fountains of Bellagio are one of Las Vegas' most iconic landmarks, originally constructed in 1998 with the opening of the Bellagio Las Vegas resort. The musical fountains, which were designed by internationally-renowned firm WET Design, span an 8.5-acre lake, utilizing 1,124 water jets shooting 460 feet high into the air. Shows take place every half-hour during the afternoon and evening hours, increasing in frequency to every 15 minutes throughout the evening and late night hours. Performances are choreographed to over 30 popular music hits, including songs by classic pop artists Frank Sinatra, Elvis Presley, and the Beatles and modern rock and EDM acts such as Tiësto and Disturbed. 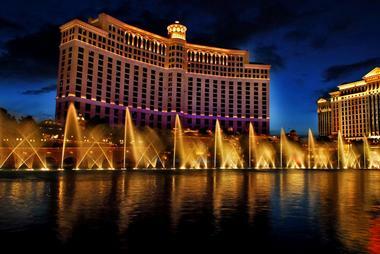 Shows may be viewed on foot in front of the Bellagio or inside vehicles from the Strip. The Palazzo Waterfall Atrium and Gardens are one of the signature attractions at the Grand Canal Shoppes, a 500,000-square-foot shopping center located within the Venetian and Palazzo hotels and casinos. The attraction is centered around a massive multi-story atrium that is home to a beautiful waterfall, overlooked by a domed skylight. 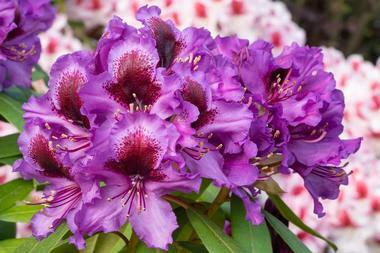 It is decorated seasonally in lush floral displays, with an emphasis on beautiful exotic plant species and blooms. Floral designs are chosen to reflect popular blooms of each season, with an additional display showcased for the Chinese New Year. 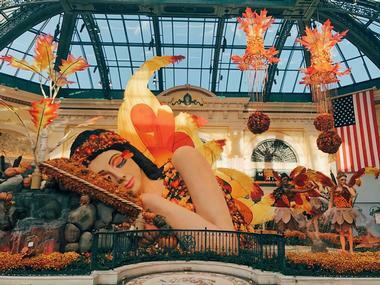 Other special event displays include a Carnivale di Venezia display, which showcases nine-foot female topiary sculptures decked out in traditional Carnival costumes. After exploring the gardens, visitors can peruse the upscale shops of the Grand Canal Shoppes, including high-end designer retail stores such as Barneys New York. The Park is an outdoor promenade at the Park MGM Resort and Casino, an AAA-Four Diamond resort opened in 1996 modeled after the idea of urban parks and oases around the United States. Its promenade is accessible for free to visitors not staying at the hotel, offering lively outdoor shopping, dining, and nightlife in the midst of one-of-a-kind outdoor decor. 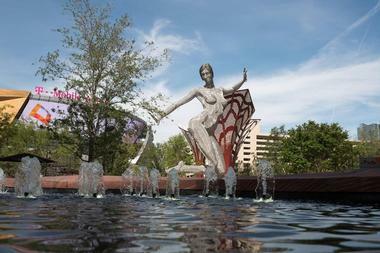 Design elements include the LED-lit Bliss Dance statue, designed by artist Marco Cochrane to evoke the atmosphere of Nevada's Burning Man festival. Water walls and illuminated neon shade structures are also showcased throughout the Park, along with a wide variety of native and exotic trees and flowers. Dining options throughout the complex include waffle concoction makers Bruxie, unique upscale Japanese restaurant Sake Rok, and national chain favorite California Pizza Kitchen. The Park also offers convenient nearby access to popular attractions such as the T-Mobile Arena and the shops at New York New York. The Welcome to Fabulous Las Vegas Sign is Las Vegas' unofficial entrance sign, located along the southern end of the city's Strip boulevard near the Mandalay Bay Hotel and the Bali Hai Golf Club. Though it is considered the entrance point of the Vegas Strip, it actually sits four miles south of the city's limits in nearby Paradise. 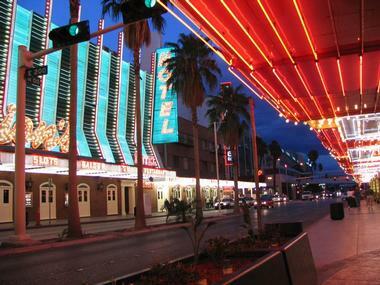 The sign was originally designed by Betty Willis and was erected in 1959 by Western Neon. It is owned today by Young Electric Sign Company and leased to Clark County, Nevada, listed on the National Register of Historic Places since 2009. A 12-car parking lot near the sign allows visitors to stop for pictures at the iconic landmark, which stands 25 feet tall and is easily identifiable due to its unique illuminated design. 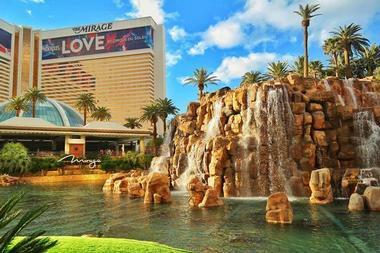 As the sign is not trademarked, visitors can find many souvenirs throughout Vegas bearing the image of the sign. 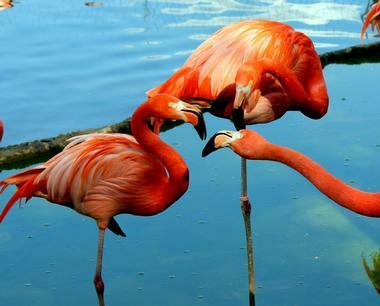 The Wildlife Habitat at the Flamingo is one of the signature attractions at the Flamingo Las Vegas Hotel and Casino, one of Las Vegas' oldest and most iconic resorts, opened to the public in 1946. The habitat fully recreates a lush tropical environment, complete with trees, waterfalls, streams, and grassland areas. It is home to a population of exotic tropical birds, including populations of the hotel's namesake brilliant pink Chilean flamingos. Other animals on display include ducks, swans, hooded mergansers, and pheasants, along with fully-stocked fish ponds and brooks showcasing koi fish and yellow catfish. A bronze memorial plaque nearby details the hotel's mid-20th century connection to infamous gangster Bugsy Siegel, located near the hotel's wedding gazebo. The habitat is open to the public seven days a week between 8:00am and 8:00pm. The Volcano at The Mirage is a spectacular outdoor display at the iconic Mirage hotel, one of Las Vegas' oldest and most well-known resorts. It was designed by renowned design firm WET Design, the creative team behind many of Las Vegas' most photographed attractions, including the Fountains at Bellagio. Two separate volcano systems utilizing a state-of-the-art sound system to broadcast sound effects recorded from real volcanic eruptions around the world. Fire and music elements combine tribal and percussive music to create a one-of-a-kind choreographic masterpiece, featuring fire shooters catapulting flame more than 12 feet into the air. Shows are presented three times nightly and are free to view from around the resort for guests staying at the hotel and pedestrians exploring the Strip. 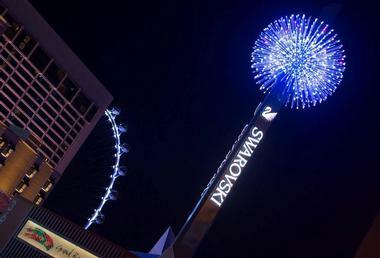 The Swarovski Midnight Celebration is a New Year's Eve-style celebration showcased each night near the Grand Bazaar Shops, lasting approximately three minutes and showcasing a 4,000-pound, 14-foot-diameter Swarovski Starburst designed to mimic the iconic Times Square New Year's ball drop. The starburst is crafted from more than 900 custom-carved Swarovski crystals, combined with 1,800 LED light points to create a one-of-a-kind multicolored light experience. It is housed within a free-standing pavilion designed to mimic a Swarovski crystal and illuminates four times nightly. The show may be viewed for free from a number of pedestrian points near the Grand Bazaar Shops. 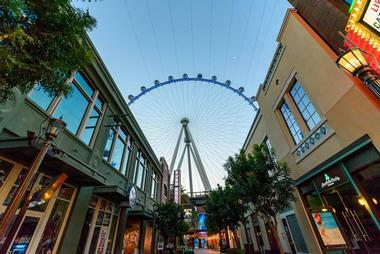 The LINQ Promenade is a pedestrian promenade and entertainment district that is located adjacent to the LINQ Hotel and Casino, near the Flamingo Las Vegas resort. It is anchored around the 550-foot High Roller observation wheel, the world's tallest observation wheel, which visitors may ride for an additional ticketed upcharge. Visitors can peruse the promenade at their leisure throughout the day and night and explore more than 40 retail options throughout the 200,000-square-foot complex. Dining and nightlife options include celebrity restaurant Guy Fieri's Vegas Kitchen and Bar, favorite national chain In-N-Out Burger, and casual dining option Tilted Kilt Pub and Eatery. Other attractions include the 2,000-capacity Brooklyn Bowl music venue, which is also home to 32 bowling lanes and a nightclub. The Las Vegas Strip Walking Tour showcases the top landmarks and attractions of the Las Vegas Strip all in one self-guided walking tour, available for download at Bigboytravel.com. 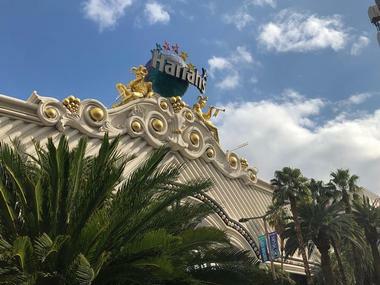 The tour begins at the Strip's southern end and spans more than 3.4 miles along the internationally-renowned boulevard, ending at the Fashion Show Mall at the Strip's northern end. 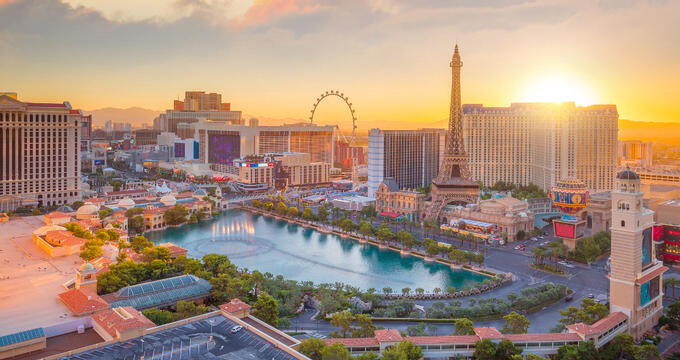 Along the way, visitors can explore the casinos and public attractions of iconic hotels and resorts, including the MGM Grand, Bellagio, Mandalay Bay, Mirage, and Venetian Hotels. Other attractions showcased include the Little Church of the West, the Forum Shoppes, and the High Roller, the world's tallest observation wheel. In all, the self-guided tour takes approximately an hour and a half for a direct walk, though visitors are advised to allow up to three days to explore all attractions in depth. Mystic Falls Park is a beautiful indoor park located at Sam's Town Hotel and Gambling Hall, which offers one of Las Vegas' largest casino gambling floors. The park is one of the hotel's central attractions, housed within a 10-story glass-roof atrium which is home to live trees, relaxing waterfalls, and animatronic animal figures. Five times a day, visitors can view the Sunset Stampede Laser Light Show at the park, which is considered to be one of Las Vegas' best free resort shows. The show chronicles the experience of pioneers in the American West in the 19th century, using state-of-the-art laser, animatronic, water, and music choreography elements. After the show, visitors can also explore the other public attractions of Sam's Town, including its bowling center and movie theater.